Now that we are a month removed from my South Carolina excursion, I'm finally getting around to day two of the adventure. Things got busy in a hurry once the weather turned nice so I'm a little behind. 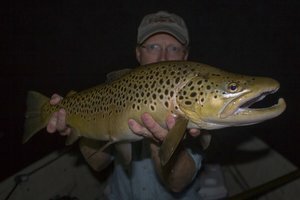 Other great stuff is on the way this week including a trip report from the Smokies last week in which I matched my second best all time day for numbers. The quality was good as well. 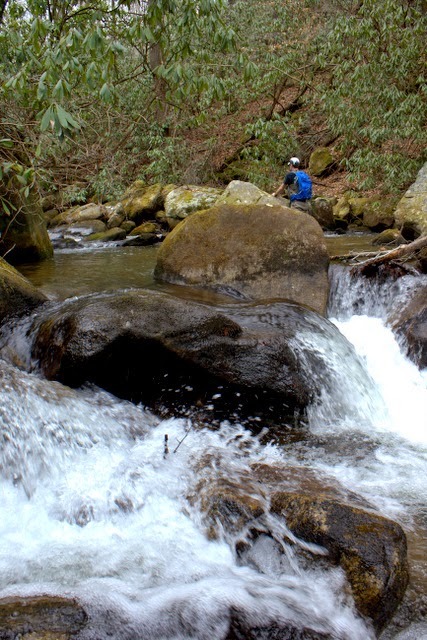 So, back to the headwater streams in the northwest corner of South Carolina, after our day one trip to explore the lower reaches of the stream, we were excited to hike in a bit and see how the stream fished higher up. The weather was again perfect and the only fly in the ointment so to speak was the necessity to get back home to help my cousin do some work around the house before it got too late. Seeing as how the stream was relatively close, that was actually not really a problem so we headed out early for a great day on the water. We headed up the trail, completely unsure of what to expect from the fish. 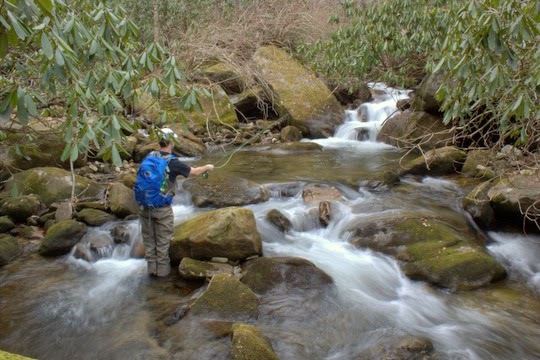 The stream was beautiful though and it was not too hard to imagine a trout or three in every pool and pocket. 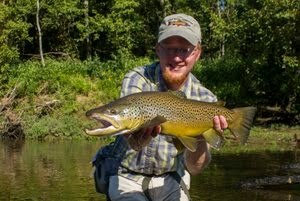 Dry flies were still tied on from the day before so we were ready to fish! 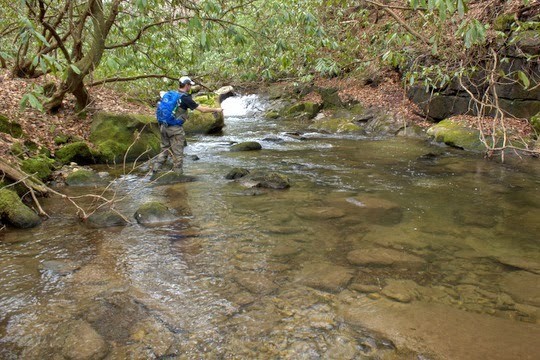 Heading slowly upstream, we had a few hits and even caught some smaller trout. The fish were obviously there but the action was not quite as fast and furious as the day before. Overcast conditions probably did not help since the sun was not warming the water as early in the day. Eventually, however, the bugs did start to show up. 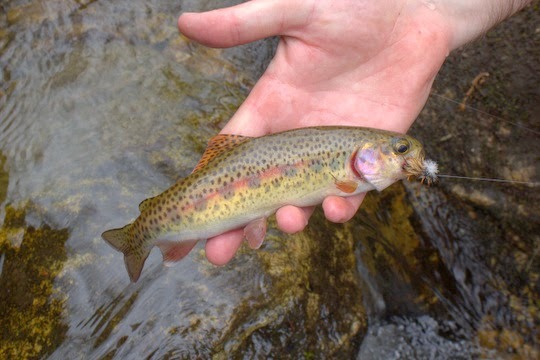 Quill Gordons were hatching along with a few stoneflies and caddis. 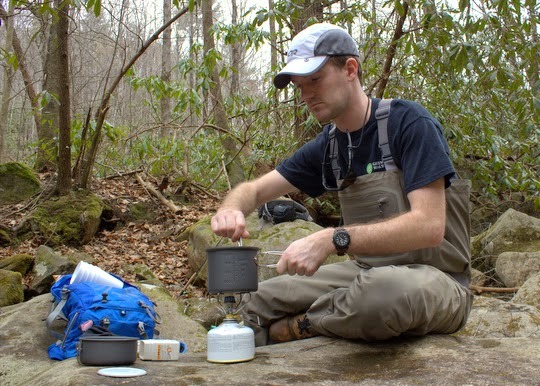 By the time we were getting hungry, we had progressed on up the stream a ways and were needing some energy to fuel our last hours of fishing for this particular trip. Some delicious chili and chips on a cool spring day hit the spot. Not long after lunch, we started finding some nicer fish. 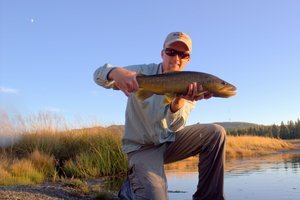 The pools were perfect and obviously provided habitat for quality trout. While the fish were still not large, they were better than the tiny two to three inch fish we also were catching at times. 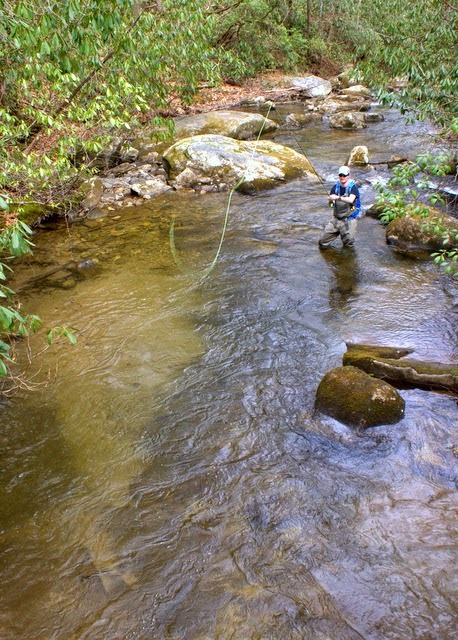 These wild streams always provide a variety when it comes to the fish size. 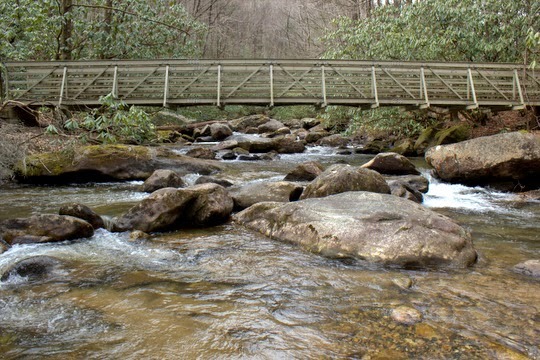 Most streams have large numbers of one and two year old fish and fewer of the three and four year old fish just because of the natural cycles. 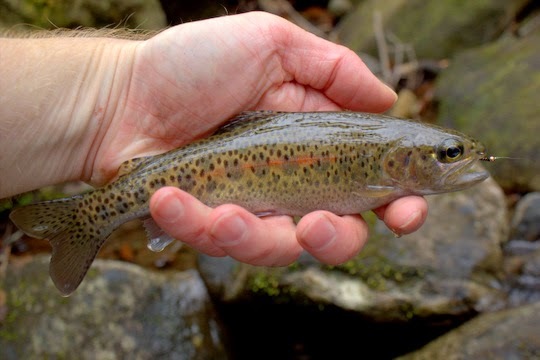 That means that any time you are on these streams you better expect to catch a few of the little guys also. While stopping to catch pictures instead of fish, I had fun with my camera and my cousin took the opportunity to catch a nice rainbow. What was particularly interesting to me about this rainbow is how golden it appeared and also how dense the spotting is. I'm quite curious about the genetics in this stream. Does anyone know how much coloration like this is a product of genetics versus the environment? 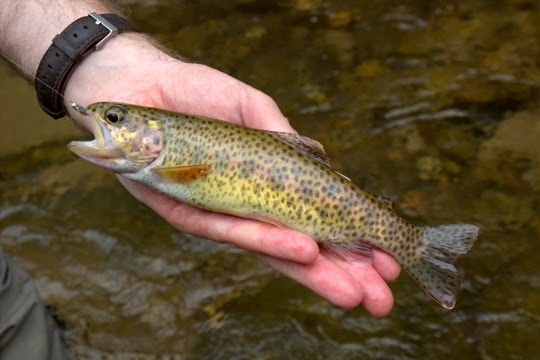 The stream produced several of these golden colored rainbows with a lot more yellow compared to the fish I catch in the Smokies. Some of the rainbows looked a little more "normal," though still with a yellow tint. Eventually, after having more fun with the camera along the way, we reached a good point where we could get out and hustle back down the trail. We were pushing our deadline to get back to my cousin's house and knew we better hurry. What a fantastic day though! I'll be looking forward to getting back down there. I went ahead and got an annual fishing license and am sure there will be more fishing adventures in South Carolina! It is definitely amazing water! 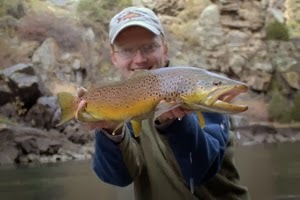 I agree with the combination of factors on the trout as well. Thanks for stopping by. What a wonderful post David. This looks like a trip where everything came together...beautiful scenery and water, excellent healthy fish and food. Thanks Howard. I couldn't have asked for a better day out on the water and that is for sure! Up here in NH I've found the color of brook trout to be determined largely by their chosen habitat. 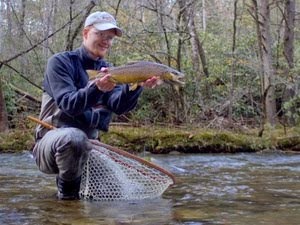 In the same streams I've caught brookies in dark black pools that were almost jet black themselves...a few pools down where they're holding over sand the fish are almost as golden as your rainbows, all within 100 yards. I'm no biologist but my experience is they camouflage themselves to match their surroundings and I've been told they can do it in a day or so too. All that aside beautiful fish man! Nice job. I was leaning largely in the direction of your explanation. This particular stream had a lot of lighter rocks and golden colored sand on the bottom so it would make sense. Thanks for the comment!